Space Systems/Loral (SS/L) announced in July 2008 that it has been awarded a contract to manufacture a new spacecraft for HISPASAT Group. 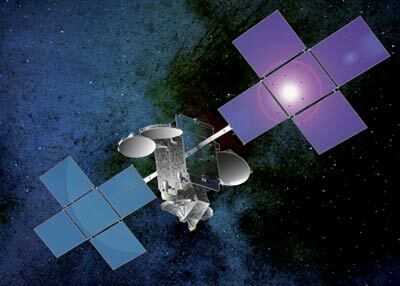 Hispasat 1E is designed to provide Fixed Satellite Services (FSS) and Broadcast Satellite Services (BSS) for 15 years or more. Scheduled to be available for launch in 2010, the spacecraft is a powerful, state-of-the-art Ku-band satellite, which will be located at 30 degrees West, further expanding HISPASAT's coverage in Europe, the Americas, and North Africa. The satellite is capable of operating up to 53 simultaneous Ku-band transponders and is based on Space Systems/Loral's space proven SSL-1300 satellite platform, which provides the flexibility for a broad range of applications. It hase a launch mass of approximately five tons and produces nearly 14 kW of prime power at end of life. In March 2016, Hispasat announced, that Hispasat 1E will be renamed Hispasat 30W-5.